1School of Pharmacy, University of Kansas Medical Center, Kansas City, USA; 2Division of Cardiovascular Diseases and the Cardiovascular Research Institute, University of Kansas Medical Center, Kansas City, USA; 3School of Medicine, University of Kansas Medical Center, Kansas City, USA. Received September 13th, 2010; revised December 31st, 2010; accepted January 4th, 2011. Fish oils containing omega-3 fatty acids (OM3FA) are widely prescribed in the management of dyslipidemia. An association between OM3FA and reduced risk of atrial fibrillation (AF) has been proposed. We examined the impact of OM3FA exposure on the risk of developing AF in patients with cardiovascular disease. Data was obtained from electronic medical records of patients seen by our cardiology service between 2005 and 2007. Patients were excluded if AF developed prior to, or on the day of, OM3FA exposure. A total of 11,360 subjects were eligible for analyses. 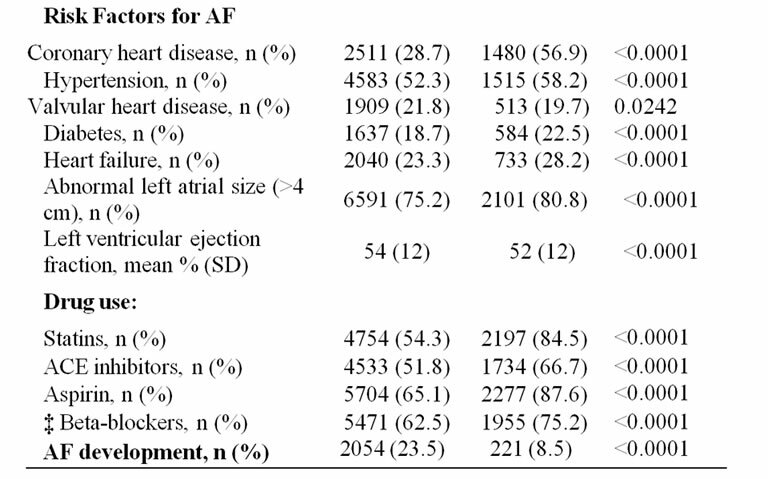 Subjects exposed to OM3FA were at higher risk for AF. 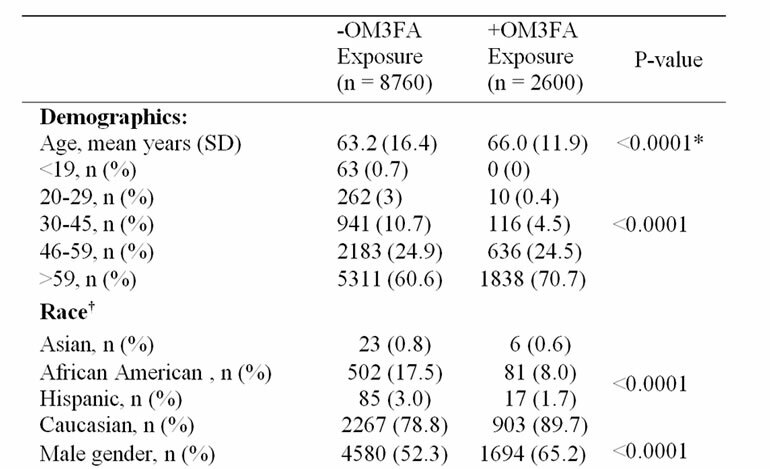 Nearly all AF risk factors were significantly more prevalent in the OM3FA exposed group. As expected, those prescribed OM3FA were also more likely to be prescribed statins, ACE inhibitors, aspirin, and beta blockers. AF occurred in 8.5% (221/2600) of OM3FA exposed subjects and 23.5% (2054/8760) of those not exposed. After controlling for AF risk factors, OM3FA exposed subjects were 74% less likely to develop AF than those not exposed to OM3FA (odds ratio 0.26, 95%CI 0.22-0.30, p < 0.0001). After controlling for risk factors for AF, OM3FA use is significantly associated with a reduced risk for AF in patients with cardiovascular disease. Potential mechanisms which may explain the ability of OM3FAs to reduce AF include its anti-inflammatory and anti-arrhythmic properties. The optimal dose of OM3FA to prevent AF is unknown and warrants prospective assessment in a randomized controlled trial of OM3FAs powered to detect significant differences in AF. Atrial fibrillation (AF) is common in the hospital setting and the most prevalent sustained heart arrhythmia in clinical practice . Patients with cardiovascular disease, such as coronary artery disease, congestive heart failure, cardiac valve disease, hypertension and increased size of the left atrium have higher occurrence of atrial fibrillation. Heart failure patients who develop atrial fibrillation are admitted to the hospital more often and have longer hospital stays . The aging population will further contribute to a higher prevalence of atrial fibrillation resulting in more hospital admissions and increased health care costs. Omega-3 fatty acids (OM3FA) have been shown to significantly reduce the risk of cardiac arrhythmias, including atrial fibrillation and all-cause mortality in patients with known cardiovascular disease (CVD) [3-6]. OM3FA are a class of essential n-3 polyunsaturated fatty acids (n-3 PUFA) that influence cardiac myocytes at the cellular level contributing to an antiarrhythmic benefit of fish oil . The antiarrhythmic properties of fish oil may help to reduce the incidence of outpatient and inpatient development of atrial fibrillation. The objective of this study was to examine the impact of OM3FA exposure on the subsequent risk of developing atrial fibrillation (AF) in patients with cardiovascular disease. This was a retrospective, observational, cohort study conducted at an academic medical center in Kansas City. The study was approved by the institutional review board. Data were obtained from electronic medical records (EMR) of patients seen by the cardiology service between 2005 and 2007. AF was defined from EMR ICD coding. Patients were excluded if AF developed prior to, or on the day of, OM3FA exposure. Patients with incomplete cardiac echocardiographic data or other important medical information were also excluded. Patient demographics, dates of OM3FA exposure or AF development, drug therapy, and risk factors that influence AF development were obtained. AF risk factors were identified via an extensive literature review. A consensus list among the investigators was developed based upon the strength of the data and availability of the variables. The final list of AF risk factor variables is provided in Table 1. Table 1. Baseline demographics and risk factors for atrial fibrillation in subjects exposed (+OM3FA) or not exposed (- OM3FA) to omega 3 fatty acids. * Satterthwaite correction used for unequal variances. † Excluded from analyses due to missing data (n = 1007 + OM3FA, 2877 – OM3FA exposure). ‡ Excluded from model entry due to significant association between use and AF development, presumably from the use of beta blockade for AF rate control. First date of exposure to beta blockers was unknown. 0.05, respectively, was used to determine the probability of developing AF after exposure to OM3FA, while controlling for AF risk factors. Successful model convergence was noted during the stepwise selection procedure. Interactions between model variables were assessed by incorporating the product of the various explanatory factors and assessing their impact on the model. No statistically significant interactions existed between the explanatory variables. Goodness of fit for the model was assessed by evaluating the Hosmer and Lemeshow test which indicated the predicted responses generated by our model were not statistically different from those which we observed. Model overfitting was checked by determining if each explanatory variable included in the model had at least 10 positive outcomes. Odds ratios and their corresponding 95% confidence intervals were calculated for the explanatory variables by exponentiation of the values of the regression coefficients. A total of 11,360 subjects were eligible for analyses. Demographic data for the study population are summarized in Table 1. Subjects exposed to OM3FA were at higher risk for AF. Nearly all AF risk factors (such as age, coronary heart disease, hypertension, diabetes, heart failure, and abnormal left atrial size) were significantly more prevalent (all p’s < 0001) in the OM3FA exposed group. Left ventricular ejection fraction was significantly lower in patients given OM3FA). As expected, those prescribed OM3FA were also more likely to be prescribed statins, angiotensin converting enzyme inhibitors, aspirin, and beta blockers due to their higher risk profile and medical indications. AF occurred in 8.5% (221/2600) of OM3FA exposed subjects and 23.5% (2054/8760) of those not exposed (p < 0001). After controlling for AF risk factors, OM3FA exposed subjects were 74% less likely to develop AF than those not exposed to OM3FA (odds ratio 0.26, 95%CI 0.22-0.30, p < 0.0001). The final model included the variables provided in Table 2. Therefore, in spite of being at significantly greater risk of AF due to a much higher predisposing factor profile, those patients on OM3FA had a significantly reduced actual occurance of AF, suggesting a possible protective effect of these substances. Table 2. Unconditional, multivariable, logistic regression, modeling the probability of developing atrial fibrillation after exposure to omega 3 fatty acids (OM3FA). cause mortality related to cardiac death in patients taking OM3FA , however no emphasis was made on the effects of OM3FA on cardiac arrhythmias. Fish oil supplementation has been reported to reduce the incidence of postoperative AF markedly from 33 to 15%  and one year reduction in the incidence of atrial fibrillation from 15.4 to 1.9% in patients following myocardial infarction [5,6]. It has been hypothesized that higher levels of circulating n-3 PUFA (polyunsaturated fatty acids) of which OM3FA are an essential class may reduce cardiac myocyte membrane excitability and reduce cardiac arrhythmias whereas lower levels of circulating n-3 PUFA may promote cardiac myocyte membrane excitability leading to increased cardiac arrythmias . Similarly, a 79% reduction in the incidence of AF was reported in dogs treated with oral n-3 PUFA who underwent vagally induced AF . The proposed mechanism was a reduction of atrial conduction velocity . Structural remodeling pertaining to changes in extracellular matrix and gap junction connexins have shown that N-3 PUFA treated dogs had 60% and 42% reduced connexin proteins CX40 and CX43, respectively . Hypothetically, with reduction in gap junctions amongst cardiac cells, the capacitance to create an effective action potential is diminished, thus leading to prevention of aberrant arrhythmias. However, these results come from an acute 14 day treatment course and long term benefits cannot be deduced. The EURAMIC study proposes that acute PUFA exposure prevented atrial fibrosis and conduction abnormalities which may explain AF suppression . EPA and DHA, which are present in fish oil have also been shown to reduce resting heart rate and increase left ventricular filling capacity  due to the ability of OM3FA to increase electrical stability of the myocardium by inhibiting calcium channels and the sodium/ hydrogen exchanger and thus mediating its antiarrhythmic effect . Many animal models have supported favorable outcomes on cardiac function imposed by long chain n-3 fatty acids in fatty fish. Rat models have shown reduction in peripheral vascular resistance , reduced left ventricular hypertrophy in hypertensive animals , decreased myocardial oxygen consumption with reduction of serum markers, improved contractile recovery, and reperfusion post ischemia . With multivariate analysis in humans, consumption of tuna or other broiled or baked fish was associated with a lower heart rate, lower systemic vascular resistance, greater stroke volume , slower atrioventricular conduction (longer PR interval), and lower likelihood of abnormal ventricular repolarization (prolonged QT)  with added benefit in serum triglycerides (–27 mg/dL) and HDL (+1.6 mg/dL) [18,19]. These clinical correlations ultimately exert a combined effort for lowering the incidence of atrial fibrillation  and possibly other less common cardiac arrhythmias. On the contrary, fried fish intake was associated with left ventricular (LV) wall motion abnormalities, reduced ejection fraction, reduced cardiac output, and higher mean BP and SVR . As with all retrospective study designs, our study has important limitations which must be noted. We were unable to definitively conclude that all significant risk factors for AF were controlled for in the regression model. There is also a concordance of high Caucasian prevalence in our study which limits benefit for multi-ethnic analysis. Additionally, some therapies which are used to treat AF are also effective in its prevention (e.g. beta blockade), which complicates analyses and interpretation. We therefore excluded beta blocker use from model entry due to the significant association between the development of AF and beta blocker use for ventricular rate control. Had we been able to determine the first date of exposure to beta blockers we would have been able to differentiate between beta blockade for rate control versus non-AF related pharmacotherapy. The optimal dose of OM3FA to prevent AF is unknown and warrants prospective assessment in a randomized controlled trial of omega-3 fatty acids powered to detect significant differences in AF. Doses which are typically recommended for cardioprotection (e.g. 1.5 grams daily) are usually well tolerated with minimal adverse effects and interactions with other cardiovascular medications . There may be a dose dependant effect of OM3FA in order to reach serum concentrations high enough to contribute to cardiac myocyte membrane stabilization and subsequently lower incidence of arrhythmias Overall it appears that the potential benefits of consumption of fish oils from fatty fish outweigh risks and that there are many potential roles in the symptomatic, physiologic, and pathologic reduction of cardiovascular disease . After controlling for risk factors for AF, the use of omega-3 fatty acid was significantly associated with a reduced risk (74%) for AF in a patient cohort with cardiovascular disease. Further clinical trials are needed to confirm this finding, but this study supports prior investigations suggesting that dietary augmentation of OM3- FA in the population with cardiovascular diseases. M. B. Covington, “Omega-3 Fatty Acids,” American Family Physician, Vol. 70, No. 1, July 2004, pp. 133-140. Gruppo Italiano per lo Studio della Sopravvivenza nell’Infarto Miocardico, “Dietary Supplementation with n-3 Polyunsaturated Fatty Acids and Vitamin E after Myocardial Infarction: Results of the GISSI-Precenzione Trial,” Lancet, Vol. 354, August 1999, pp. 447-455. G. Laurent, G. Moe, X. Hu, B. Holub, H. Leong-Poi, J. Trogadis, K. Connelly, D. Courtman, B. H. Strauss, P. Dorian, “Long Chain n-3 Polyunsaturated Fatty Acids Reduce Atrial Vulnerability in a Novel Canine Pacing Model,” Cardiovasc Research, Vol. 77, No. 1, January 2008, pp. 89-97. , A. Aro, F. J. Jiménez, J. M. Martín-Moreno, I. Salminen, P. van't Veer, A. F. Kardinaal, J. Gómez-Aracena, B. C. Martin, L. Kohlmeier, J. D. Kark, V. P. Mazaev, J. Ringstad, J. Guillén, R. A.Riemersma, J. K.Huttunen, M. Thamm and F. J. >Kok, “Omega-3 Fatty Acids in Adipose Tissue and Risk of Myocardial Infarction: The EURAMIC Study,” Arteriosclerosis, Thrombosis, and Vascular Biology, Vol. 19, No. 4, January 1999, pp. 1111-1118. S. Grimsgaard, K. H. Bonaa, J. B. Hansen and E. S. Myhre, “Effects of Highly Purified Eicosapentaenoic Acid and Docosahexaenoic Acid on Hemodynamics in Humans,” American Journal of Clinical Nutrition, Vol. 68, No. 1, July1998, pp. 52-59. I. Savelieva and J. Camm, “Statins and Polyunsaturated Fatty Acids for Treatment of Atrial Fibrillation,” Nature Reviews Cardiology, Vol. 5, No. 1, January 2008, pp. 30-41. D. Von Au, M. Brandle, H. Rupp and R. Jacob, “Influence of Diet Rich in Fish Oil on Blood Pressure, Body Weight and Cardiac Hypertrophy in Spontaneously Hypertensive Rats,” European Journal of Applied Physiology and Occupational Physiology, Vol. 58, No. 1, January 1988, pp. 97-99. D. Mozaffarian, J. S. Gottdiener and D. S. Siscovick, “Intake of Tuna or Other Broiled or Baked Fish versus Fried Fish and Cardiac Structure, Function, and Hemodynamics,” The American Journal of Cardiology, Vol. 97, No. 2, January 2006, pp. 216-222. W. S. Harris, “n-3 Fatty Acids and Serum Lipoproteins: Human Studies,” American Journal of Clinical Nutrition, Vol. 65, No. 5, May 1997, pp. s1645-s1654. R. G. Anand, M. Alkadri, C. J. Lavie and R. V. Milani, “The Role of Fish Oil in Arrhythmia Prevention,” Journal of Cardiopulmonary Rehabilitation and Prevention, Vol. 28, No. 2, March-April 2008, pp. 92-98. J. W. M. Cheng and F. Santoni, “Omega-3 Fatty Acid: A Role in the Management of Cardiac Arrhythmias?” Journal of Alternative and Complementary Medicine, Vol. 14, No. 8, 2008, pp. 1-10.